Das russische Reich nach seiner allmaehligen Vergrösserung. 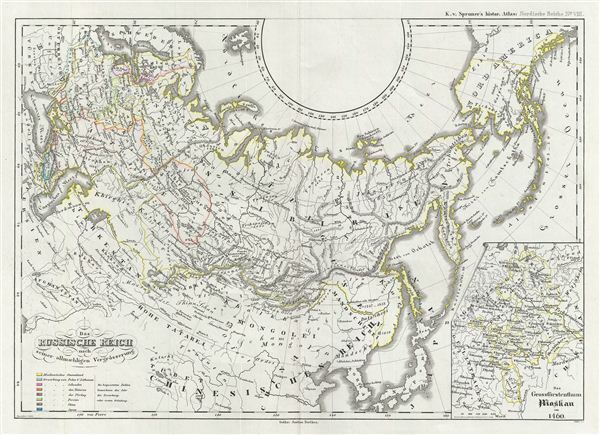 This is Karl von Spruner's 1854 historical map of the Russia empire following its gradual transcontinental expansion in the 18th century. The map covers from the Arctic Ocean south to China, and from Sweden to North America. An inset map on the bottom right corner details The Grand Dutch of Moscow (Muscovy) around 1460. During this time, Ivan III was the Grand Prince of Moscow and all of Russia. One of the longest reigning rulers of in Russian history, he managed to triple the territory of his state. The first to use the title of Tsar, he freed Russia from Tartar control and made Moscow the most powerful city in Russia, hence earning him the title of 'Ivan the Great.' The whole is rendered in finely engraved detail exhibiting throughout the fine craftsmanship of the Perthes firm. Prepared by Karl Spruner for publication as plate N VIII in the second edition of Justus Perthes' 1854 Historich-Geographischer, Hand-Atlas zur Geschichte der Staaten europa's vom Anfang des Mittelalters bis auf die Neueste Zeit. Karl von Spruner (November 15, 1803 - August 24, 1892) or Spruner Karl von Merz or Spruneri was a Stuttgart born cartographer, scientist, and map publisher active in Germany during the middle part of the 19th century. Joining the Bavarian army at the tender age of 11, Spruner dedicated most of his life to military service. Spruner's superiors, recognizing his keen intellect, eventually assigned him to the army's cartographic division. Military education earned him the title of Doctor of Cartography in 1852. In 1855 he attained the rank of Lieutenant-Colonel and, in 1883, General. Cartographically, Spruner is best known for his historical atlases, most of which were published by the Justus Perthes firm. His much admired maps studiously applied historical political geographies to contemporary physical geographies. Spruner also worked with Heinrich Theodore Menke, a well-known German mapmaker, to produce and later revise his many historical maps. In 1886, after 72 years of professional military service, Spruner formally retired. He died seven years later in Munich in on August 24th of 1892. Spruner, Karl, Historich-Geographischer, Hand-Atlas zur Geschichte der Staaten Europa's vom Anfang des Mittelalters bis auf die Neueste Zeit, 1854. Very good. Blank on verso. Original centerfold. Original platemark visible.